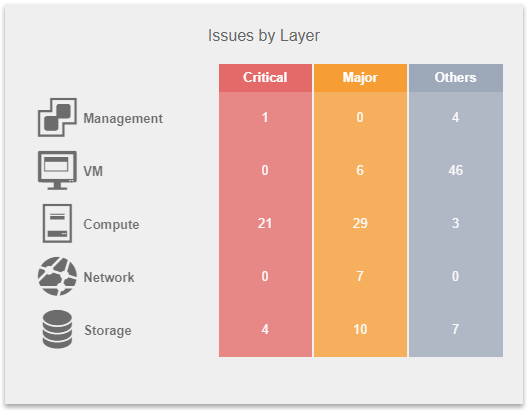 Runecast Analyzer is a proactive issue detection software for VMware vSphere environments, powered by the largest database of automated VMware KB articles which feed its internal archive of known issues. With the new release version 1.7 the analysis is now extended also to vSAN environments and can really help not only during the infrastructure validation but also for the maintenance and operation of the infrastructure itself. Also if vSAN has already a powerful healt check engine, that verify several aspects of the configuration, from the hardware part (like the firmware and drivers) to the high level part (like the cluster health), Runecast Analyzer can provide other check that are not covered by the internal vSAN checks. 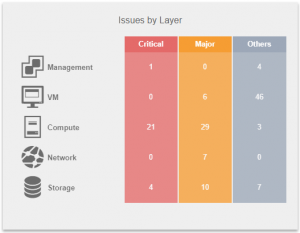 The first news is the the VMware stack visibility that consists in five main layers: “Management”, “VM”, “Compute”, “Network” and “Storage”. This is a first step to provide a full and end-to-end visibility of your infrastructure, in all its components and levels. For each of them, as usual you have several details, including the reference source, the type of impact and the importance level, the risk rating, and some hints on how resolve or manage the condition. In this case you can have more details compared with the standard vSAN healt check, especially on other services that may be impacted by some possible vSAN configuration issues. Again you will have different degree of severities, according with the possible risks and type of impact. Of course, but just because it’s not a goal of Runecast Analyzer, you don’t have any performance analysis or benchmark or baseline comparisons. In those case, you need other tools, specific of HCI benchmarking. It works with both vSphere web Client: the vSphere Web Client (Flash) and the vSphere Client (HTML5).